Regular Rate $589 . Today Only $149! Located just minutes away from all of the excitement of the glittering Las Vegas Strip and Las Vegas Convention Center, Tuscany Suites & Casino provides you with a relaxing getaway perfect for business travelers, a long weekend with friends or your next family vacation. Inspired by the Tuscany region of Northern Italy, our hotel boasts a warm and welcoming atmosphere surrounded by lush gardens, some of the largest standard hotel suites in the city and thoughtful amenities to ensure the most comfortable stay possible. Whether you are only in Las Vegas for a weekend or in need of an extended stay, Tuscany Suites & Casino is your Las Vegas home away from home. Suites Are Among The Largest In The City. Refresh Your Mind, Body And Spirit With A Rejuvenating Spa Treatment At The Spa At Tuscany. The rooms were a really nice size and beds were comfortable! I was surprised how quiet it was on the property, which was nice. Love that a Casino was attached so when you can't sleep, had something to do. It was very clean and a close walk to the strip! 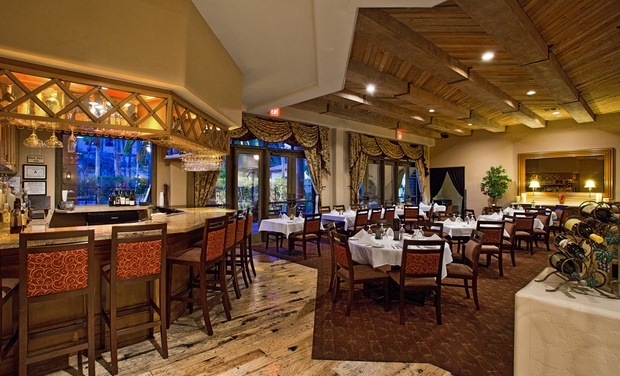 The Tuscany Suites & Casino proudly offers three delicious on-site Las Vegas dining venues, guaranteed to satisfy the most discerning palates. Whether you're craving fine Italian cuisine, a fresh sandwich to-go or late-night breakfast favorites, they've got all of your Las Vegas dining desires covered. Pub 365 features a colleciton of 365 rotating beers and a menu of traditional pub fare with a modern spin including homemade small bites, iconic burgers and locally world-famous tacos. Located inside Tuscany Suites & Casino in Las Vegas, Pub 365 is a true beer lover's dream with an extensive beer collection that will include an evolving list of rare, specialty brews. Casually elegant, artisanal food and drinks take center stage at Caffe Bottega, our relaxed Italian-style eatery. Enjoy fresh-baked pastries, tasty breakfast sandwiches and Stumptown Coffee Roasters coffee in the morning. For a quick bite, try one of our artisan flatbreads, panini, fresh salads or charcuterie plates paired with a variety of delicious wines or craft beers from local breweries. This is a very nice off the strip hotel and casino. The room was large and very comfortable and the staff was very nice and accommodating. The landscape and building was beautiful especially with the Christmas decorations! See you again!! 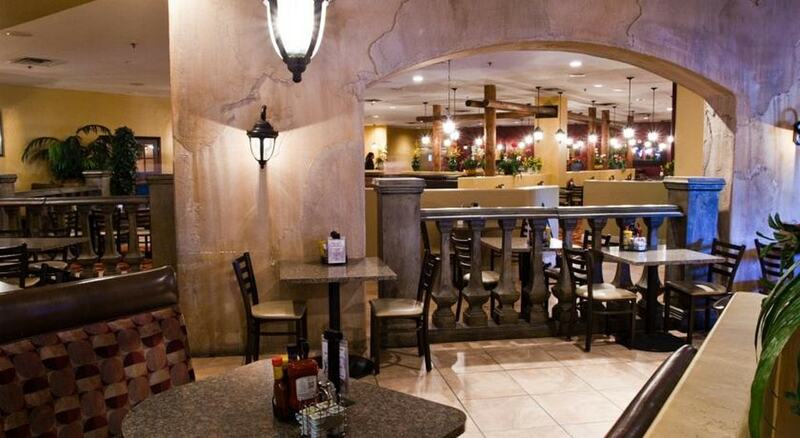 The employees and staff were excellent and would recommend the Tuscany to friends and relatives. The casino is off the strip which makes it quieter and less people to contend with. Public transit is available out the front door or a 20 minute walk will get you onto the strip it that is preferred. You can't beat the price for a place to stay while in Vegas. "Nice Hotel - 1 mile from the strip"
Stayed for 4 days in the hotel, we got the room little inside but it was comfortable. We needed the microwave and asked for atleast 5-6 times and then finally we got the same. Also, it takes you 15-20 min walking for the strip, while going its easy though while coming you get too tired and dont want to walk, hence better to take taxi even if it looks closer. Its pool and the spa pool, both were good. We enjoyed at its casino and the cafe which was too good. It was open 24/7, service was very good and the pancake, vegge omlette. "Very Nice Hotel Just off the Strip"
I was there with a sister primarily to hike. However we did drive to a few major hotels to look around and for their buffets. This was an ideal location and good value. The hotel is organized into a number of 2-story out buildings where the rooms are. Thus, you can park (outside) close to your building. It's a short walk to the central building where the lobby, casino, bars, and restaurants are located. The room was large with two queen beds, couch, easy chair, coffee table, dining table with 4 chairs, desk, refrigerator, and single cup coffee maker (good coffee). Large bathroom with separate tub and shower and toilet room. The toilet room has a separate door inside the bathroom. Quiet, clean and secure. It has a casino, Italian fine dinning, mid-price restaurant, takeout/fast food, pub, entertainment room/bar, fitness room, and coin laundry. No buffet. A number of discount coupons are given to you at check-in. Bar drinks and wine are expensive. 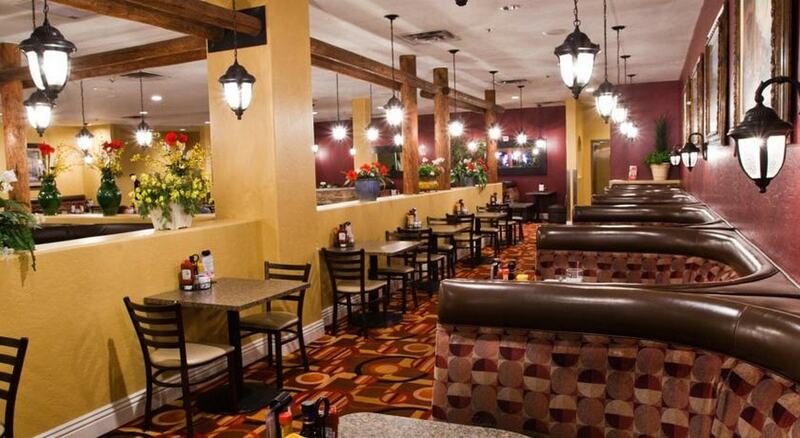 We chose this place because it was just off the strip and across from the Hughes Center which has great restaurants. The rooms were very large. The bed gave a good night's sleep. We were in building D which had just been redone. We would go back. Checked in late and staff was very helpful. Large,clean room but could hear footsteps from room above. Affordable and friendly staff in "Marilyns Cafe". is small but liked that better than in the larger ones. .Would definitely stay there again. Close to airport. "Great beginning for our new adventure!" Vegas is Vegas right? Not always.Here, at the Tuscany suites and Casino you can find a perfect get away right around the corner from the most happening boulevard in Vegas! The suites are spacious and extremely clean, we stayed 2 separate times this trip, and both times we were equally pleased. Checking in and out was a breeze. The restaurants and pubs were decent, and the staff was great! While I was here, I also checked out the banquet space. They had great space, very well kept! I would definitely keep this place in mind for my next event!!! "Great hotel with large room"
The check in was good and staff helpful. Walking into the room I was impressed with the size. It was clean and nicely decorated. It wasn't right on the strip but was within walking distance, which I liked. Rooms are huge and clean. Not too far off the strip, and there are plenty of convenience store within walking distance. The casino is slow paced and never seemed to be super busy. They do have a free wi-fi and also offer paid wi-fi, I must say the free option was not great at all. I do hear if you get a room in a building closer to the lobby area you can use that wi-fi. It does work well in the lobby area and cafe areas. They offer 2 buildings for smoking rooms, I and K are smoking buildings. "An oasis off the strip"
We saw the reviews of this hotel on TripAdvisor and decided to try it out. We could not have been happier! Smallish hotel complex two blocks off the strip. Several buildings make up this hotel. About 7-8 buildings, all just 3 floors tall, two pools, fitness center, coffee spot and two restaurants on site. The casino is connected to the main building via small walkway, so you do not have to run the smokey, lights flashing gauntlet to your room. The front desk staff was excellent.They made the check in fast and easy. The rooms are HUGE, with a small sink and fridge. There is a sleeper sofa, chair desk and chest of drawers for your clothes. The bathroom is just as spacious as the room. "Huge, Clean and Comfortable Room"
My wife and spent three nights during last week's Thanksgiving holiday. We stayed Tuesday through Friday and we both agreed that The Tuscany was the best choice. The room has got to be the largest regular priced room in Las Vegas. Huge, comfortable and firm king bed. The room had a sofa, stuffed chair, desk and a small dining table near the small kitchenette. The hotel is about a block and a half from the strip and took maybe ten minutes to walk to. We loved that the hotel was not on the strip as we loved the peace and quiet we would have not gotten if we had stayed on the strip. Check in was quick and easy, the price cheap (because everything else in Vegas is not), and the room and facilities were clean. If your not enamored with staying on the strip, this would be a great choice. "Awesome hotel in a great location!" "Really good for the price"
Smaller hotel and Casino, owned by one person. I liked the restaurants and the room was huge and clean. Smaller typ casino and has a William Hill Sportsbook. I would definitely recommend this place to others. We spent a night in Tuscany Suites. Comfortable rooms, good Wifi, and a suitable place to stay with the family. The hotel had a good pool, good parking facilities and was a 15 minute walk to the strip. Clean and quiet as well. Though this hotel is a short walk off the strip, it offered everything a girl in Vegas could want. A big room, a casino, a bar and coffee bar. The breakfast was very good too. We did not get to sample any of the other restaurants. The lounge act was a bit tame for my taste, but was a nice touch. Overall, this property is a gem! Another great visit to Tuscany's in Las Vegas ! You won't find a place with better value for the money. We held our business meeting here. Great sleeping rooms - spacious and more than adequate for Vegas when you spend little time in rooms. Gaming space was adequate. Shows were very good. Like the PUB 365 too - recent addition ! We went to see the Rat Pack show which was very good although they were not able to seat our party of four together. We really enjoyed the casino, not too big or small. Great coupons when you sign up for their player's club. Alot of choices for types of slots and video poker. Food and prices at Marilyn's Cafe were excellent and included all day breakfast. Regular Rate $ 589 . Today Only $149!